Crop fields in Belgium, in May. So how can we be sure that the different near-infrared reflectance between two fields is because the fields are used to cultivate different crops? In order to identify a particular crop, we need to be familiar with its growth cycle (germination, growth, pollination, senescence). Some crops last for a couple of months, other need more than 6 months to complete their growth. In addition we need to know in advance, how the crops reflect the near-infrared at each of their various growth stages. 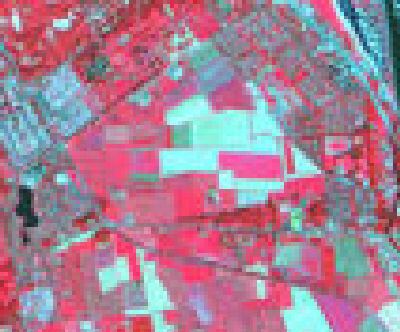 The two false colour images above, are showing the same fields in Belgium at two different periods, May and August. Within each field the signal is relatively similar, suggesting that a single crop is being used in each field. Question: Why does the left image appear much more clear than the right one? The images were captured by two different satellites. The sensor that captured the left image has a better spatial resolution than the one that captured the right image, and can therefore record data in higher detail. The same fields, in August. If we compare the same fields in the two images, we can see that in some cases the signal is different. 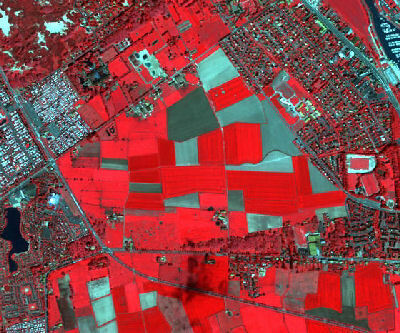 Fields that appear red (high near-infrared reflectance) are full of vegetation, whereas those that appear blue (low near-infrared reflectance) either have very little or no vegetation at all. In that case the recorded signal is originating from the ground. Having the knowledge of when each crop is planted and harvested, we can estimate the percentage of vegetation cover through the growth period, assuming no external factors (stress, disease, etc.) affect its growth. With this knowledge and by studying two or more images from the same growth period,	we can look at the multispectral reflectance signal at each growth stage and identify what crops are grown in each field. By looking at the near infrared we can tell if there are a lot of plants in a field or not. Combining this information with the knowledge of when each crop type germinates, grows and is harvested, we can use two or more images from one year to identify the crop type, simply by seeing how much growth there is at each time the images were taken.